To support the professional development of its graduate students through the presentation of original research, the College of Arts and Humanities awards travel monies to significant national and international conferences. There will be three competitions per year with approximately nine awards given in each competition. Eligible expenses include transportation, lodging, registration fees and per diem for food. Up to $500 for travel within North America and $700 for international travel. Priority will be given to students attending national or international conferences of major professional organizations. ARHU particularly seeks to help students toward the end of their graduate careers gain experience and make contacts important to their intellectual and professional development and to their job prospects. However, the Fellowship Committee will hold aside a certain amount of funding for students presenting original work at prestigious conferences early in their careers (e.g., before advancing to candidacy). Preference will be given to students who have not had an ARHU Travel Award in the past, unless it was an early career award. Awards will not be given for travel that has already taken place. These applications must be entered on time into the online system to be considered for the current cycle. The online application system will close at midnight on each of the three deadline dates below. Please check with the individual program graduate director about departmental deadlines. 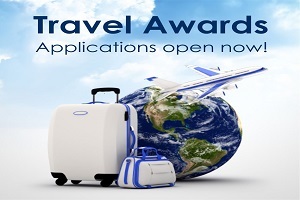 The application process for Travel Awards is entirely online. No paper applications will be accepted. Students should go to http://apply.arhu.umd.edu and click on Travel Awards, provide all the supporting information, and submit the application. (Students can work on an application, save, and come back to the site as well, so they don’t have to do everything at once). Brief description (no more than two paragraphs) of the research to be presented, its significance in the field, and the format of the presentation (e.g. paper on a panel, poster presentation). Please keep in mind that the research should be contextualized for non-specialists. Brief description of the conference and its organizing body, including the url of the conference/organization website. Include a statement of the review process for the accepted research. Statement of the contribution the conference will make to your career. Statement of whether application has been made for this trip to other funding sources (e.g. Goldhaber Travel Awards from the Graduate School). Students are encouraged to apply for outside funding. If you have questions about the Travel Awards themselves, or if your students have questions, please contact Trevor Parry-Giles, 301-641-0019 or tpg@umd.edu.